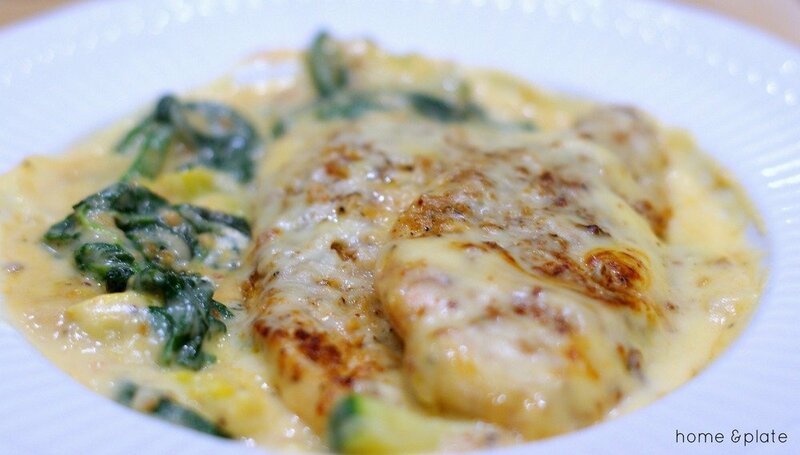 My Cheesy Chicken with Spinach, Zucchini & Squash is the perfect chicken dinner with garden vegetables for a weeknight meal. This Cheesy Chicken with Spinach, Zucchini & Squash is a snap to cook up in 30 minutes and is as a perfect dinner for a mid week meal. I am always looking for a new way to cook up chicken because chicken can get boring. This recipe is by no means boring. It’s delicious. I needed a way to use up the fresh spinach, zucchini and squash in my fridge. I browned the chicken on the stove top until they were just crispy. Then I chopped up the fresh veggies and tossed them and the chicken in the oven to roast for a little while longer. What makes this recipe so yummy is the thin creamy cheese sauce I poured over the entire dish. It accompanies the chicken deliciously as well as the fresh vegetables. Another perfect way to cook up a plain piece of chicken. Who said chicken was boring? Preheat the oven to 450°F. Place the spinach, squash and zucchini in a rectangular glass dish. Slice each breast in half lengthwise. 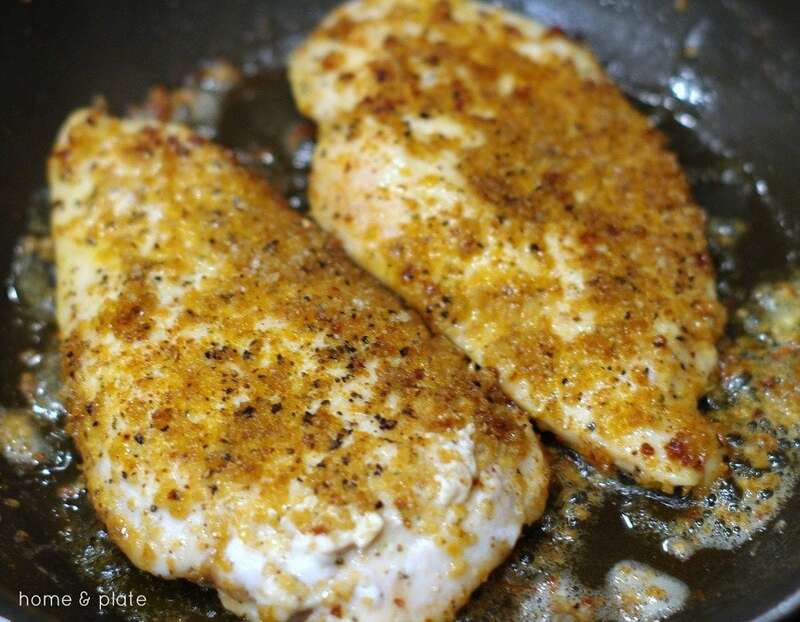 Dredge each cutlet in the bread crumbs. Season with salt and pepper. 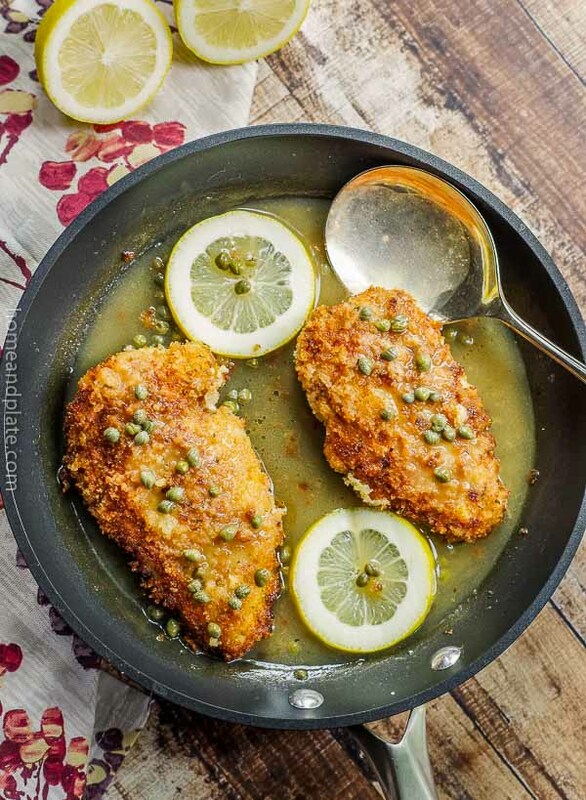 Over medium heat on the stovetop, heat the olive oil and 1 tablespoon of butter and sauté each cutlet for three minutes a side. Remove from the heat and place the chicken in the glass dish on top of the spinach, squash and zucchini. Bake for 15 minutes. Meanwhile in a separate pot on the stove top, melt the butter, and add the flour and stir for a minute until well incorporated. Then add the milk until creamy to create a roux. Add the cheese and stir to melt. Add more milk if necessary to thin the cheese sauce. 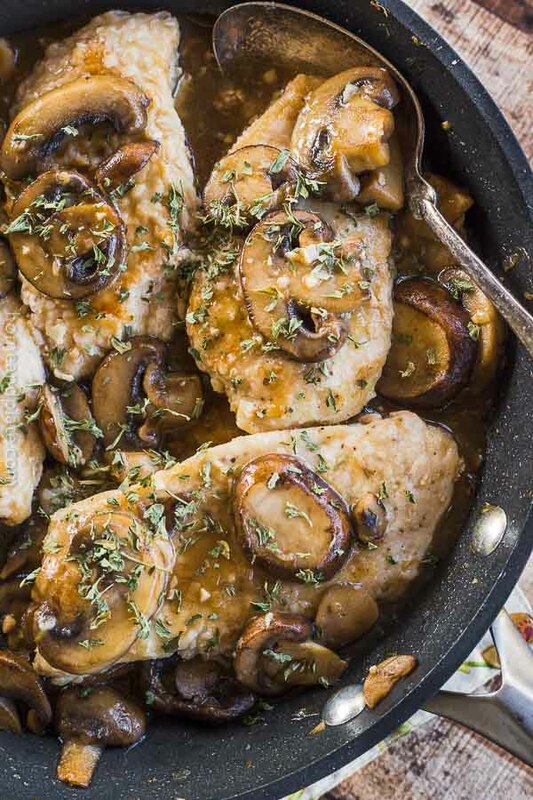 Simmer slowly on the stovetop until the chicken and vegetables are ready. 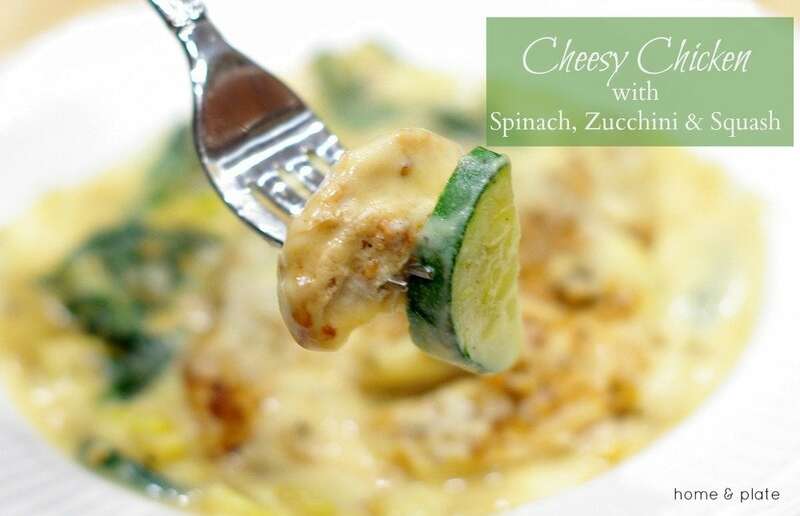 Once the spinach is wilted and the zucchini and squash have softened pour the cheese sauce over the chicken. Serve immediately. What a terrific meal–that looks like you plotted and planned for days to create the right blend of flavors, not that you just threw it together! Well done. My family is always more interested in eating up the veggies in the farm share when they are incorporated into the main dish, so I’m glad to have this recipe. Thanks Kirsten. Anything with veggies is delicious especially picked fresh off the farm. This recipe won’t disappoint. What a perfect blend of vegetables, and I love how quickly it comes together, too. Thanks Christine…it does dress up plain chicken. Thanks for the love. I wasn’t sure what a roux was… and the instructions leave out the flour. Here’s to winging it and hoping for the best! Thanks Marlene for that omission. I edited the directions to make it clear. Hope you enjoy it. 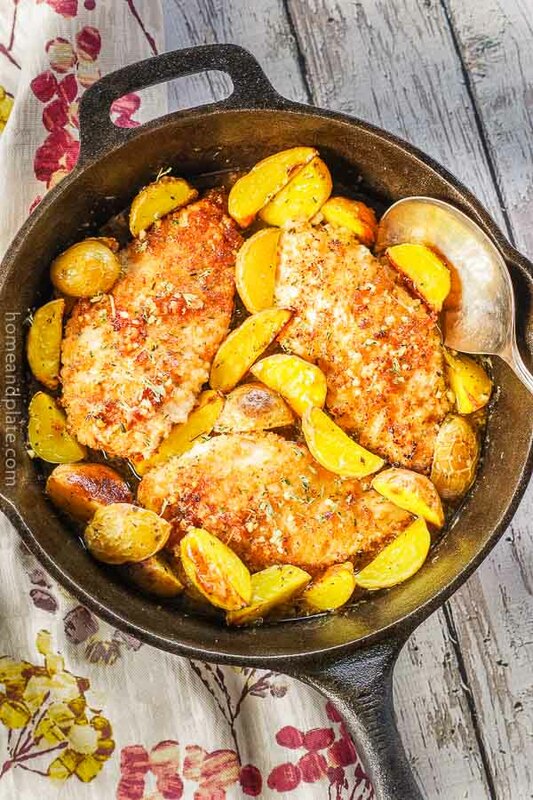 According to the text above the recipe, you put the vegetables in the oven to bake while you are cooking the chicken in the skillet. However, according to the recipe instructions, the vegetables do not go in the oven until after you have cooked the chicken in the skillet–at which point you put the two in the oven together. I just want to clarify the proper procedure so I don’t mess this up. Thanks! 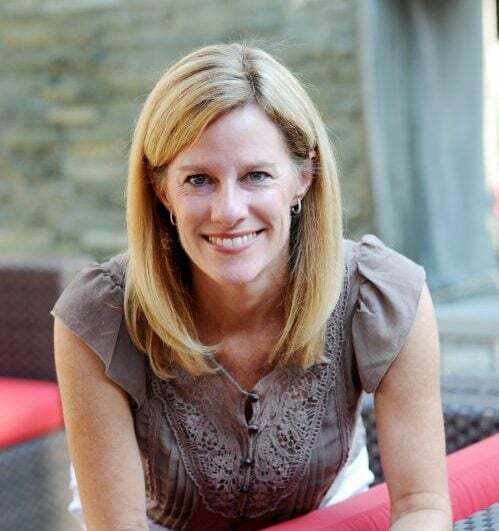 Thanks Jennifer for your inquiry. I will update my post so there are no questions. But do follow the actual recipe. The chicken will still need to cook a bit after browning in the skillet. The veggies can go in the oven with the chicken. They won’t take long to cook about 15 minutes or so until the veggies are tender. Thanks again for bringing this question to my attention. I hope you enjoy the recipe.